MMP (Mushroom Model Publications) is a book company based in the U.K. All their books are printed in Sandomierz, Poland by their associate Stratus Publications in English. Stratus also prints books in Polish. This new book is soft-cover in 8 ½” x 12” page format of 80 pages. The cover shows the tail of a Breguet 27 with a flight of two 27’s behind it. The back cover has a color profile of Breguet 27, the Potez 39 and the Mureaux 115/117. These profiles are repeated inside the book. This is the third book in the French Wings series and it continues to provide an interesting and informative look at some of the less famous French aircraft of the pre-WWII and WWII period. All three aircraft in this book were used in the observation and reconnaissance role by the French military. The book gives you information about both the process by which they were acquired and their actual operational use. In addition to the aircraft used by France, their use by China, Peru and Venezuela are also discussed. For the Potez 39 there are 12 profiles, four 3-views and 4 color illustrations of upper wing letter codes. One color illustration shows markings for Peru. Two of the profiles show the aircraft with pontoons mounted. For the Mureaux 115/117 there are 11 profiles, three 2-views and three 3-views. What is neat is that these color illustrations are on the same page as actual black and white pictures of the aircraft being illustrated. Also illustrated in full color are the badges of French Groupes de Reconnaissance units. There are 174 black and white photos included in the book. 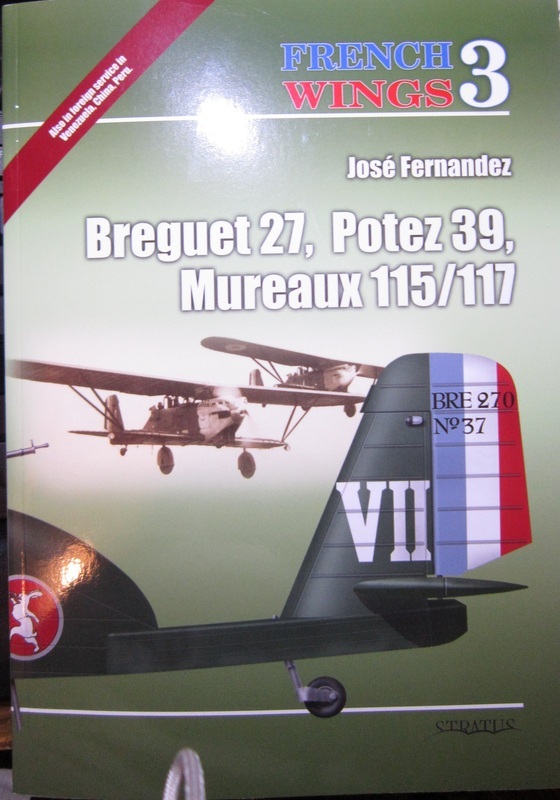 Included in the chapters on the Breguet 27 and the Potez 39 are some interior shots. There is a data list of aircraft serial numbers included. I did a search of the internet to see if any model kits exist of these 3 types of aircraft. What I found was just a 1/72nd scale kit of the Breguet 27 by AZUR. I could find no kit in any scale of the Potez 39. For the Mureaux 115/117 things were better. There is a 1/72nd scale kit by both Heller and Aerofile. In 1/48th both POMK and WSW have done kits of it in resin. On the title page is the color illustrations of the cover arts for 2 other French Wings book: No. 1 on the Latrcoere 290 & 298 and No.2 on the Nieuport- Delage NI-D29 & NI-D62 Family. I got this book from Casemate Publications in Pennsylvania, who is the N.American distributor of MMP books. inside a heavily padded envelope that was again inside another padded envelope. Very good packaging. I highly recommend this book to modelers and aviation historians alike. I want to thank Casemate and Dr. Roger Wallsgrove, Editor-in-Chief of MMP for this review copy.